On the day of its release, Amazing Spider-Man #569 has sold out at Diamond (though copies will be available at retail level)! 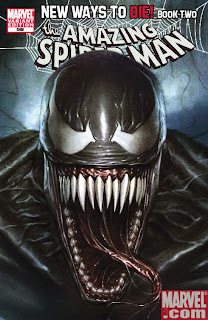 The second part of the hotly anticipated "New Ways To Die" storyline marks not only the first appearance of Anti-Venom, but also the second straight sell out for Spidey's summer blockbuster, which IGN.Com deemed a, "well-plotted, intelligent superhero story." Who is Anti-Venom? Why have the Thunderbolts assaulted Peter Parker? And just what does Norman Osborn know about the connection between Peter & Spider-Man? Find out in Amazing Spider-Man #569, in stores now!